Nagpur : On 1 st February, Cummins College of Engineering for Women witnessed a Fashion Show named Anannya. 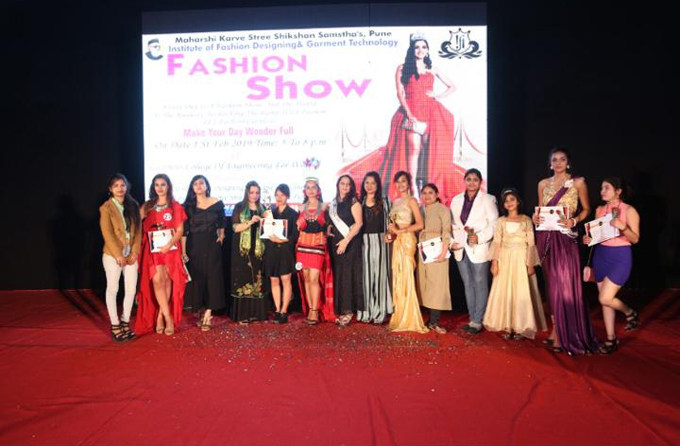 The participants were the college students of IFT, Maharshi Karve College, Deo Nagar, Fasion Planet Trimurti Nagar and Fly Fashion Institute who performed under the guidance of Ms. Kripa Sawlani. The models dazzled the stage in 3 rounds namely World Costume, Mom & Me and The Designer Competition Round. The occasion was graced by Mr. Nityanand Tiwari, Ms. Surekha Saraf, Ms. Varshika Hariramni and Mr. Debashish Ghosh as honorable chief guests of the event. The competition was judged by the glamorous Nina Johar, Ms. Mahima Jaypure and Diva Mrs. Maharashtra 2016 Swati Banerjee. Ms. Pratiksha Bhusari bagged the 1 st prize in World Costume round while Kalyani Mohurle and Gauri Nimbalkar won the Mom & Me round. The final competition winners were Khiubunpilak Nbung at 1 st place, Twinkle Pahade at 2 nd place and Rashi Budhrani at 3 rd place. The prizes for the event were sponsored by Ms. Swati Banerjee in the loving memory of her younger brother Sandeep Gangal.